Nov. 13, 2017 8:07 p.m. Hundreds of Parksville Qualicum Beach are residents and visitors turned out to honour Canada’s veterans at Remembrance Day commemorations in three local communities Saturday, Nov. 11. Participants and onlookers braved chilly, blustery conditions as Arrowsmith Royal Canadian Legion branch 49 in Parksville hosted its annual commemoration service with a parade to the cenotaph at city hall, and Bowser Legion branch 211 its own parade to the cenotaph outside the legion hall for prayers, music and the laying of memorial wreaths. Attendees at the Canadian Legion branch 76 commemoration in Qualicum Beach moved out of the weather for the service at the Qualicum Beach Civic Centre, but participants did take part in parades both to and from the commemoration. The commemorations were marked by uniformed Canadian Forces members, both active and retired; by RCMP members in red serge; personnel from area fire departments and BC Ambulance Service; air and sea cadets; federal, provincial and municipal politicians; First Nations leaders and others. Each ceremony featured playing of the Last Post by a trumpeter and the bagpipers’ lament. The Mount Arrowsmith and Qualicum Beach pipe bands both marched in their respective parades in Parksville and Qualicum Beach, and several of the Mount Arrowsmith pipers attended the Bowser commemoration to march and perform. 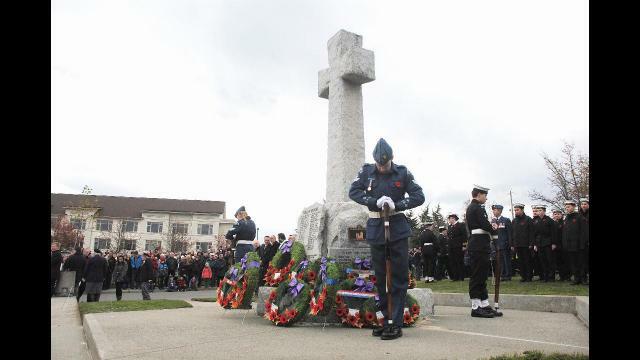 The day included the annual war-plane flyover by pilots Roger Yorke and George Kirbyson, who buzzed the parades in both Qualicum Beach and Bowser before flying low and slow over the moment of silence at the Parksville cenotaph. In Bowser, the event ended with the release of more than a dozen white doves. Each of the three legion branches then opened their respective halls for food, drink and companionship. See more photos from each of the commemorations at www.facebook.com/PQBNews.